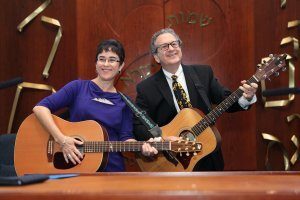 Temple B’nai Shalom’s corps of volunteer song leaders – Rob and Rachel – joyfully lead music for our services. Rob Weissman grew up in New Jersey, where he was a song leader for the Jersey Federation of Temple Youth (many, many years ago). His family (wife Marilyn, son Adam, and daughter Sarah) were founding members of the Temple; Sarah was actually the first girl born within TBS. Rob is delighted to have led music at services at TBS for more than 10 years. When not playing guitar, Rob practices law as general counsel for an environmental consulting firm. Rachel Schreiman grew up in Southern California where as a teenager and young adult she studied voice and led songs for her National Federation of Temple Youth region and at the Union of Reform Judaism’s Camp Swig. 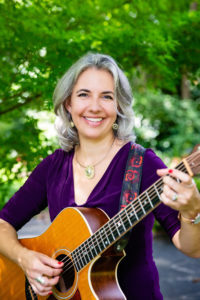 After packing up her guitar and focusing on career and family for many years, Rachel along with her husband Dave and three sons Jacob, Evan, and Adam relocated to Virginia and joined TBS where she agreed to teach music. Working with Temple youth rekindled Rachel’s love of Jewish music and she is thrilled to be able to share that joy during Tot Shabbat and regular Shabbat services in the main sanctuary. We are delighted to announce that we will have a very special cantor at TBS for the 5779 High Holy Days! Cantor Rosalie Boxt, one of the foremost cantors in America today, is again joining our TBS clergy team. Cantor Boxt is a graduate of the Debbie Friedman School of Sacred Music at HUC-JIR in New York. Originally hailing from St. Louis, Missouri, she attended the University of Pennsylvania where she earned a Jewish Studies major and Theatre minor. Before entering cantorial school, she worked for the URJ’s NFTY Programs in Israel. She currently serves as the Director of Worship for the URJ and is the Biennial Worship Director. She mentors cantors in the field and consults congregations and clergy on issues of worship and music. She is also a past Vice-President for Member Relations of the American Conference of Cantors (ACC). She is a Synagogue 2000 Fellow, and a Partner in the Kalsman Institute on Judaism and Health, and runs a non-profit called Kesher Shir: a venture which brings together Jewish musicians from diverse backgrounds to study, collaborate, and create meaningful music and worship experiences. We are grateful to have someone with Cantor Boxt’s experience, talent, and leadership here with us for the most important and sacred time of the Jewish year. 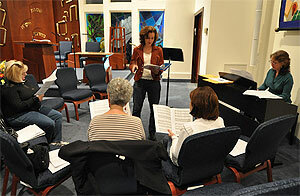 Temple B’nai Shalom offers many opportunities for anyone who likes to sing. Our Friday night services are filled with music. 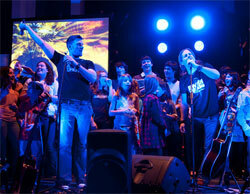 We have organized singing groups and groups that meet for special services throughout the year. We also have an adult choir open to any adult who likes to sing. The group sings at our Thanksgiving service and has been called upon to sing at other times through out the year at services and special events. The men and women, and older teens who participate find this an important way to nourish their love for singing with their connection to our temple. We also have a vibrant teen choir called T-Jam. Have you attended our Meditative Music sessions before Friday night services? They’re a wonderful transition from the work-a-day week into the Shabbat mood. Our members Sue Kohn and Brad Stein bring their musical talents to us often throughout the year. Meditative Music can be heard once a month at 7:45 p.m. before Friday night services. Check the calendar for details. TBS is proud to be a music-loving congregation. We frequently host concerts and guest artists at the temple. Please see our calendar for 2017/18 dates for Sheldon Low and other Jewish artists. Brotherhood offers a Jewish Musical Meditations CD created by our very own Brad Stein. You may have heard Brad playing Jewish Musical Meditations before Friday night services, and his piano virtuosity has been captured for our listening pleasure. This CD features Brad’s arrangements of your favorite traditional and contemporary Jewish music. Brotherhood donates all proceeds from CD sales to TBS. Come visit us at Bagel Bar for a listen, or contact Brad Stein for additional information.